PRINTED TICKETS ONLY AVAILABLE AT DREADNOUGHTROCK and FROM JOHNSTONE BOWES. 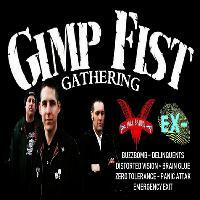 Gimp Fist headline the first all day Punk gathering at Dreadnoughtrock in this special ALL DAY EVENT. Doors 12.45pm Tickets £15 in advance. Please don't expect tickets to be available on the night for this one as the demand is already mental. DOORS 12.45pm . Live Music wrapping up 11pm approx. Tickets Online from Tuesday 4th September 2018. LIMITED Amount of Printed Tickets will be made available as soon as possible. Running Order will be confirmed nearer the time.